HÀ NỘI – Deputy Prime Minister Trương Hoà Bình has urged the four central coastal localities affected by last year’s environmental incident to complete compensation by June 30 this year. He made the request at the seventh meeting of the Steering Committee on stabilising the lives and production of people in four central provinces – Hà Tĩnh, Quảng Bình, Quảng Trị, and Thừa Thiên – Huế, which were ravaged by the incident caused by Taiwanese firm Formosa in April 2016. According to Deputy Minister of Agriculture and Rural Development Vũ Văn Tám, the People’s Committees of the four affected provinces have distributed the third prepayment (paid out of the State budget before receiving full compensation from Formosa) of compensation to all districts and locals. They approved more than VNĐ 4.528 trillion (US$198.92 million) out of VNĐ 5.28 trillion ($232.37 million), or 85.8 per cent of pre-paid compensation. As of April 24, the provinces disbursed VNĐ 4.244 trillion ($186.6 million), equivalent to 93.7 per cent of the approved amount and 80.4 per cent of the total advance payment. Hà Tĩnh province distributed VNĐ 1.129 trillion ($49.29 million), while Quảng Bình province allocated 1.98 trillion VNĐ ($87.13 million), Quảng Trị VNĐ 460.9 billion ($20.28 million) and Thừa Thiên – Huế VNĐ 579 billion ($25.48 million), said Tám. The Health Ministry reported that it took samples to test 5,369 tonnes of seafood (excluding jellyfish, fish sauces, dried and frozen seafood) gathered from April to August 2016. So far, the provinces have destroyed nearly 1,104 tonnes of unusable seafood in storage, paying 50 per cent of its value to affected individuals and organisations. Production and living conditions of locals in four provinces are basically stabilised, said Tam, adding that fishery resources have recovered. As many as 70-80 per cent of the vessels operating near the coast have resumed operation, while the figure is 80-90 per cent for offshore fishing boats. In the first quarter of this year, the total catch in the localities was 25,386 tonnes, a fall of 8.8 per cent over the same period last year, he said, adding that farmed aquaculture production was 6,279 tonnes, a rise of 3.12 percent. After considering the provinces’ request for nearly VNĐ 768 billion ($33.79 million) of additional compensation, the Ministry of Agriculture and Rural Development (MARD) proposed the Government pay 30 per cent of the value of stocked frozen seafood meeting food safety requirements. The ministry also asked for approval for the destruction and compensation of 100 per cent of the value of rotten jellyfish and dried seafood stored in coastal localities at an estimated cost of VNĐ 377.448 billion ($16.61 million). Responding to this request, Deputy PM Trương Hoà Bình assigned the chairmen of the people’s committees of the four provinces to take responsibility for determining the beneficiaries and the quantity and scale of compensation, while proving the seafood was gathered within April and August last year. He asked the Ministry of Finance to supervise the work. The Deputy PM also requested the Ministry of Natural Resources and Environment continue guiding localities to gather samples for evaluating seawater quality in the four localities, while monitoring Formosa Hà Tĩnh’s operations. The MARD was asked to continue collecting seafood, seawater and sediment samples for testing. At the same time, the ministry was urged to send fisheries surveillance forces to support the four localities in guiding fishermen not to exploit seafood in the seabed of waters within about 20 nautical miles off the coast from Hà Tĩnh to Thừa Thiên – Huế. The mass fish deaths were first reported on April 6, 2016 when a large number of fish washed ashore in Hà Tĩnh province. The incident also occurred in Quảng Bình, Quảng Trị and Thừa Thiên – Huế provinces. 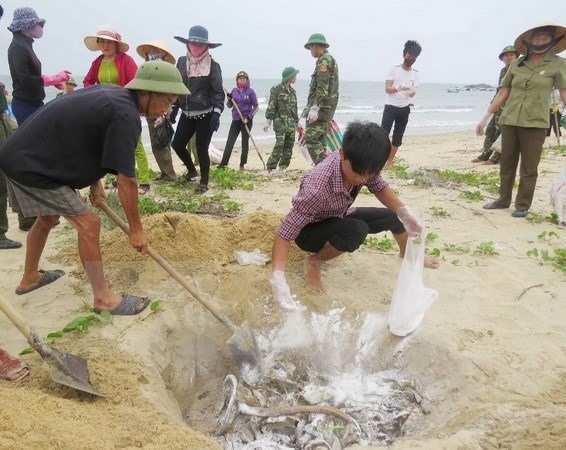 About 70 tonnes of dead fish were found in the four provinces and Thừa Thiên – Huế alone reported 35 tonnes of farm-raised fish had died.